Although spectacles existed long before, the compound microscope was the first instrument specifically designed to magnify small objects in a major way. This happened so long ago that the records do not definitively disclose who invented the instrument. Hans and Zaccharias Jansen have been given the credit by some historians, but the bulk of the evidence does NOT support this claim. What we do know is that compound microscopes existed in the 1590's and that in 1609 Galileo Galilei was using a compound microscope. Some Italian historians credit Galileo with the invention, but there is no real evidence to support this; Galileo was certainly one of the earliest users of both the telescope and compound microscope. In 1619 Cornelius Drebbel was exhibiting a compound microscope in London, with two convex lenses. In 1625 Giovanni Faber of Bamberg first coined the term microscope. The details of most of these early compound instruments dating to before the time of Hooke, Campani and Divini, are not well documented; their constructive details, when pictured or discussed, are only derived from incomplete descriptions and poor illustrations. It is from the middle of the 17th century that good illustrations, and some actual instruments now survive. Among the earliest of these are instruments by Hooke, Divini and Campani. In 1665 Robert Hooke published Micrographia, a collection of biological micrographs. He coined the word cell for the structures he discovered in cork bark. The construction and appearance of his compound microscope is among the earliest of which we have good documentation and good engravings. The earliest extant microscopes also date to the early to mid 17th century. 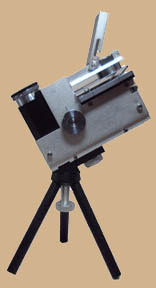 Campani and Divini microscopes are from this era. From slightly later in the century there are also in existance, microscopes made by Yarwell, and a few others; some of the microscopes of this time are unsigned and so their specific origin and makers in some cases remain uncertain. Most of the few surviving instruments from the 17th century exist in museums and are valued in the 100's of thousands of dollars. Few private collectors possess (or could afford) one of these instruments. Yarwell instruments from the late 1600's are small tripod instruments similar to the Italian models in some ways. Most serious collector's earliest instruments date to the eighteenth century. Found early in the 1700's, John Marshall microscopes exist only in very exclusive collections. 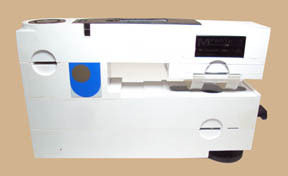 Major progress in microscope design started in the early nineteenth century and culminated in the 2nd quarter of the nineteenth with achromatic aplantic optics and rigidly supported stands; as optics improved further, so did the stands themselves. The modern microscope, with built in illumination, controls close to the bottom of the microscope, and solid reliable adjustments did not reach a peak until the 1960's when the first Leitz Ortholux microscopes with completely modern features were produced. * Further refinements of the light microscope continued into the twentieth century, and even now into the twenty first, with the relatively recent introduction of digital imaging and confocal microscopy. Of course the electron microscope was a major advance, but this web site will limit itself to light microscopes. *Although the first Ortholux dates to 1937, it did not yet include all the features that today would be considered a fully modern instrument, this did not occur until the 1960's. This site shows microscope in my collection, formerly in my collection, and selected instruments from the collections of my friends willing to share their images. The site includes compound microscopes of the 18th, 19th and 20th centuries. Some instruments in this collection date to as late as the last quarter of the 20th century. Although no compound instruments from the eighteenth century still remain in my own collection, some which were formerly in this collection are included on this website for interest. Countries of origin represented include U.S.A., Austria, China, England, France, Germany, Japan, and Poland. 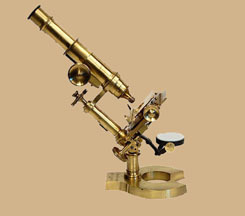 Most surviving antique microscopes are from the U.S.A., England, France and Germany, with a few from other countries; this fact is reflected in this collection. Currently there are about 120 compound microscopes listed on this page, with about 100 of these still in my collection. Many more are yet to be listed as time permits. As noted above, the microscopes are listed by Date, by Country of Origin, by Maker, and by Type of microscope. In this way, if your interest is in instruments by a particular maker, or from only one country, you can find those instruments easier than if you had to search all the microscopes organized only one way. Click on a picture to see more images and details. c. 1790 ENGLISH GEORGE ADAMS (Jr?) CULPEPER-TYPE COMPOUND MICROSCOPE ? c. 1850-1862 GERMAN OPTICAL INSTITUTE WETZLAR(A) CONTINENTAL MICROSCOPE ? c.1900 AMERICAN, FRENCH MADE WILLIAMS, BROWN, AND EARLE LISTER LIMB STUDENT ? c. 1st Third of 20th C. FRENCH ----- COMPOUND PORTABLE THREAD COUNTING TEXTILE MICROSCOPE ???? c. 1935 GERMAN ATCO PORTABLE ? Note that makers are determined by signature on the instrument, or attributed(A) to a particular maker by certain known important features of construction; otherwise the maker is listed as unknown. c. 1968 JAPANESE NIKON McARTHUR-TYPE 'HP' or "H3"
Note that this classification is based on traditional categories, but is somewhat arbitrary. c.1900 AMERICAN, FRENCH MADE WILLIAMS, BROWN, AND EARLE LISTER LIMB STUDENT/HOUSEHOLD ?